Mr Peter Hain (Neath) (Lab): Is it fair that Welsh churches, charities, caravanners, pensioners and almost everybody else will pay more taxes so that millionaires can each pay £40,000 less? Mr Jones: That is a very strange rhetorical question. The right hon. Gentleman will know that the reduction in the top rate of tax will not take effect until the end of the public spending freeze and it is quite interesting that the Government of whom he was a member did not see fit to increase the rate of tax until a matter of weeks before their last Budget. Mr Hain: I am amazed that the hon. Gentleman is not ashamed of that impact on some of the most vulnerable in our society. Can we in Wales, through him, apologise to the Secretary of State? We used to think that she was all on her own at sea in the Cabinet, but clearly they are now all at sea together. The Budget omnishambles, Abu Qatada, petrol pump panic—at least Wales has a Labour Government to give us some protection from this Tory-Lib Dem incompetence. At least Wales can reject this disastrous Budget by voting Labour in the council elections next Thursday. 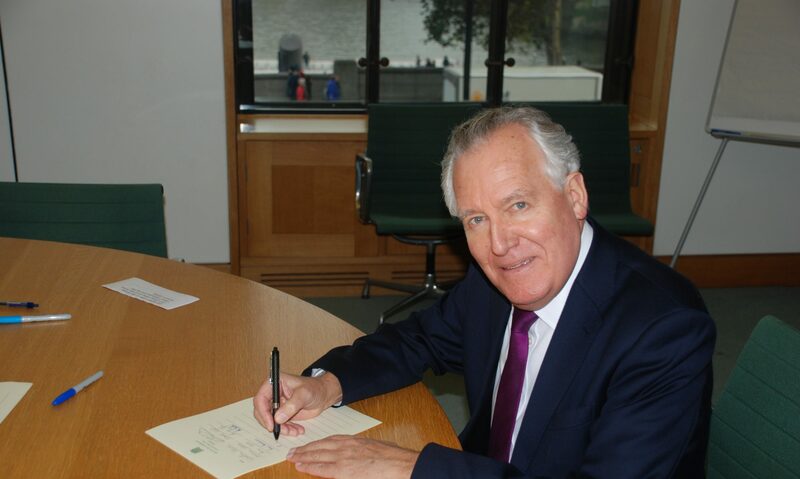 Mr Peter Hain (Neath) (Lab): I join the Secretary of State in marking St David’s day. Will she join me in marking Wales’s magnificent triple crown victory over England on Saturday? I am sure she will have no trouble in doing so. Since coming to office, how much private sector inward investment have the Secretary of State and her Government helped to bring to Wales? Mrs Gillan: What a magnificent victory that was. It brought a tear to a girl’s eye to see the team doing so well. As far as the match on Sunday goes, Cardiff were robbed and they played very well. Inward investment and that side of business life are devolved to the Labour Welsh Assembly Government, as the right hon. Gentleman should know, given that he was an architect of the legislation. Since coming into government, I have met delegations from Taiwan, China, Turkey, Japan and Russia to promote Wales as an investment decision. Indeed, I launched the first ever trade mission of Welsh businesses to Bangladesh, led by the Wales Bangladesh chamber of commerce. I stress to the right hon. Gentleman that there needs to be a partnership between the UK Government and the Welsh Government because when making inward investment decisions companies look at the UK as a whole. We need to give them reasons to go to Wales. Mr Speaker: The Secretary of State’s replies are immensely courteous, but I am afraid that they are a bit long. Mr Hain: I thank the Secretary of State for her reply, but remind her that in the 15 months since the Government spending review, the UK economy has grown by a miserable 0.2%—15 times less over the same period than the Office for Budget Responsibility’s 3% growth prediction in June 2010 after Labour left office. That collapse has massively damaged inward investment and jobs in Wales. Is it not high time that the Government changed course and followed the lead of the Labour Welsh Government with their Jobs Growth Wales scheme, which provides jobs for 4,000 young people in Wales? Where the Tories are hammering Wales, Labour is standing up for Wales. Mrs Gillan: I have to say that I will take no lessons from the right hon. Gentleman, particularly given that, since we came into government, we are investing £1 billion in electrifying the great western main line and putting £60 million into broadband. It is important that both Governments work together. If the First Minister goes on a business delegation and brings back business to Wales I will be delighted, but I think that we should work together—and, for the right hon. Gentleman’s information, we will be sticking to plan A.
Mr Peter Hain (Neath) (Lab): On funding, why does the new high-speed rail plan not follow the original route via a Heathrow hub, allowing south Wales travellers direct access to the airport and a direct connection to the network? Mrs Gillan: As the right hon. Gentleman knows, that was the previous Labour Government’s route. Matters concerning high-speed rail, HS2 and Wales are handled by the Under-Secretary of State for Wales, as he well knows. I will arrange for my colleague to write to him. Mr Speaker: We are on the subject of funds to the National Assembly. Mr Hain: I find that reply astonishing. The right hon. Lady is Secretary of State for Wales. She has a duty, as has the whole of the Wales Office and as did her predecessors, to advance the interests of Wales. Is it not the truth that she failed to make the funding case for Wales on HS2 and we lost a great opportunity? Is it not the truth that she has spent the past 18 months demanding expensive funding concessions for her Buckinghamshire constituents, rather than advancing Wales’s funding interests? Is it not the case that she has been more concerned with stopping trains, building tunnels and selling houses in her constituency than with supporting investment, growth and jobs to benefit Wales? Mrs Gillan: I am surprised by the right hon. Gentleman, because in all the years that he was Secretary of State for Wales, he did not achieve the electrification of one single inch, whereas we in the Wales Office have already announced the electrification of the line to Cardiff. Electrification of the line to Swansea is still open and that is unfinished business. As he well knows, we are now working on the electrification of the valleys line. I hope that I will have his support for that as well. I am pleased that we have been able to give the House an opportunity to debate in Government time the work of the Silk Commission, the commission that I announced on 11 October would examine devolution for Wales. The coalition agreement contained three specific items on Wales. First, we promised to take forward the housing legislative competence order that had been held up by the previous Government, and I am pleased to say that we delivered on that. Secondly, we promised a referendum on granting primary legislative powers in devolved areas to the Welsh Assembly Government, and we delivered on that, although on taking office I found that preparations were—how shall I put it?—behind the curve. Mr Peter Hain (Neath) (Lab): As the Secretary of State will be aware, at least two coal mines in south Wales, Aberpergwm and Unity, have been in receipt of inward investment that is growing their employment and output. May I thank both mines for voluntarily helping to resource the rescue and investigation work following the terrible tragedy at the Gleision mine in the Swansea valley that caused the death of four experienced colliers, my constituents Charles Breslin, Philip Hill, Garry Jenkins and David Powell? May I also thank the Secretary of State for her support over this tragedy, which has included ensuring that the Government have agreed to provide the 25% uplift—equivalent to the charitable gift aid that could have been claimable—to the total raised by the Swansea Valley miners appeal fund, which is now rising towards £400,000, which shows an extraordinary and heartfelt public response? May I also thank the mines rescue service, the principal inspector of mines and the South Wales police for their dedicated and at times heroic work at Gleision? Mrs Gillan: Like the right hon. Gentleman, I pay tribute to those who so valiantly led the rescue efforts in the immediate aftermath of last month’s tragedy at the Gleision mine, and I pay tribute to the right hon. Gentleman for his work in his constituency. He and I saw those efforts at first hand, and I know the impact that that event will have had on his local community. As the shadow Secretary of State says, I have agreed that the Government will contribute to the Swansea Valley miners appeal fund to cover the amount that the fund would have been able to claim back as gift aid while its application for charitable status was being processed. I am pleased to say that charitable status has now been secured, and we in the Wales Office are working with the fund organisers on the details of the Government payment. Mr Hain: I am grateful to the Secretary of State for that. I believe that there are a number of important lessons from the Gleision tragedy for the future of mines safety and rescue. Will she therefore ensure that the Government delays the report of Professor Lofstedt, due by the end of this month, on regulations covering mining, among other sectors, so that account can be taken of a submission that I plan for her and her Cabinet colleagues? Mrs Gillan: I understand that Professor Lofstedt is conducting an independent review of the overall regulatory framework covering health and safety legislation and its effectiveness. He issued a call for evidence in May and is now in the process of writing up his report. As this is an independent review, it would not be appropriate for my right hon. Friend the Minister with responsibility for employment or the Government to intervene in the timing of the report. However, I am sure that any lessons that can be learned from the investigation into the tragic events at the Gleision mine will be incorporated into any recommendations from Professor Lofstedt’s report that are taken forward by the Health and Safety Executive. I look forward to receiving the right hon. Gentleman’s submission on this subject. Mr Peter Hain (Neath) (Lab): The Government told Parliament that the cost of disability living allowance will be cut by a fifth—or 20%. Will the Minister tell the House what loss of income that might mean for the average DLA claimant in Wales and how many will be affected? Mr Jones: As the right hon. Gentleman knows, the programme is aimed at helping people get into work, including those who are in receipt of DLA. It is essential that the interests of those in receipt of DLA are properly protected, which is what this Government are committed to doing. Mr Hain: The truth is that the Minister has not got a clue about how to answer that question, so let me help him out. Calculations backed by figures from the House of Commons Library suggest that the average reduction will be £14 per week for 125,000 DLA claimants in Wales, which amounts to a total of £90 million a year or more than £700 each. Has he any idea how much suffering that will cost when we also take into account sky-high VAT, food and petrol prices? The truth is that under this Government, rich bankers are coining it while the most vulnerable and needy are punished. It is the same old nasty Tories. When will he and the Secretary of State stand up for the people in Wales? Mr Jones: May I remind the right hon. Gentleman that the reforms that we have in hand are caused in large measure by the fact that his Government completely destroyed the economy of this country and ensured that it did not pay to work? Our reforms will ensure that those in receipt of DLA will be properly taken care of, but we will also make certain that those who can work will work, and that work will pay. Mr Peter Hain (Neath) (Lab): Does the Secretary of State think that the Calman process will be as beneficial for the Tories in Wales as it was in Scotland last Thursday? Will she also congratulate Carwyn Jones on polling Labour’s highest ever Welsh Assembly vote, which included taking Cardiff North—about the safest Conservative seat in Wales—and beating the Liberal Democrats in Cardiff Central and Plaid Cymru in Llanelli? Will she ensure that if any financial concessions or flexibilities are offered to Scotland by her Government, as is now being suggested, Wales will receive equivalent benefits to compensate for the horrendous cuts that the Government are imposing on Welsh citizens? Mrs Gillan: The right hon. Gentleman is on dangerous ground here. I do not want to engage in any sort of triumphalism or tribalism, to use the words of Carwyn Jones. The right hon. Gentleman will note that I came to the Dispatch Box to congratulate Carwyn, because I have worked well with him over the past 12 months. May I just remind him that the Conservative vote went up to 25% in Wales and the number of our seats went up to 14? We are now the second largest party in the Assembly, and the right hon. Gentleman had better think again before he starts taking us on. Mr Speaker: Order. I just remind the House that we are on the subject of devolution funding. Mr Hain: I know that the hon. Members for Cardiff North (Jonathan Evans) and for Vale of Glamorgan (Alun Cairns) will disagree with the Secretary of State on that, because Labour won the Assembly seats in their constituencies with thumping majorities. If, as the Chief Secretary to the Treasury suggested yesterday, Alex Salmond is to get the borrowing powers that he is demanding, as well as the ability to reduce corporation tax, how will increasing borrowing fit with her Government’s preoccupation with reducing the deficit at all costs? Furthermore, is not her Conservative-led Government playing into the hands of separatists by promoting separate economies? Mrs Gillan: I would never play into the hands of separatists; I am a devoted Unionist, as I hope the right hon. Gentleman is. Before the Assembly elections, he and his party consistently boasted that they would win a majority in Wales, and I consider failing to do so a significant failure for him and his leader. On the question of separatism, however, he will know that my door is always open, and I would hope that we could join in common cause on this matter. He and I, and his party, support the United Kingdom and I want to ensure that all steps taken by the Wales Office will reinforce the United Kingdom. I see him nodding, and I am grateful for his acknowledgement that he would join me in that cause. I am sure that we can work well together on that. Mr Peter Hain (Neath) (Lab): Will the Secretary of State join me in welcoming the resounding yes vote in the referendum on 3 March? As she knows, I legislated on behalf of a Labour Government for primary powers for the Assembly in 2006, and we are delighted at this historic day for Wales. I hope she is too. Mrs Gillan: The shadow Secretary of State must have been asleep when I answered the question in the first place and said that I welcomed the yes vote. I said that specifically during the passage of the Government of Wales Act 2006, when I sat in his position. I am also delighted that, despite prevarication, it was a Conservative-led coalition Government who delivered that referendum for the people of Wales. Mr Peter Hain (Neath) (Lab): Does the Secretary of State have any meetings on rail electrification scheduled for 1 April? Mrs Gillan: I am sure that if the right hon. Gentleman wants details on my diary, he can ring the office. Mr Hain: As it happens, I have details of the right hon. Lady’s diary here. Instead of progressing rail and other Wales matters, the entire Wales Office ministerial team-the Secretary of State and the Under-Secretary, the hon. Member for Clwyd West (Mr Jones)-will be at a Conservative party fundraising event in Chesham and Amersham. This is no April fool’s day story: I have the invitation here. If he says that the business case is strong, why the delay? Mrs Gillan: I am ashamed that the shadow Secretary of State for Wales has wasted his two questions and resorted to trivia. Unlike him, I take this matter very seriously. The letter that I received from his wife actually made more sense than his questions at the Dispatch Box today. Mr Peter Hain (Neath) (Lab): Of course, those decisions about Anglesey were taken by the Labour Government and supported by the excellent MP, my hon. Friend the Member for Ynys Môn (Albert Owen). I wish the Secretary of State and all at the Wales Office festive greetings. The Office for Budget Responsibility estimates show that the actions of her Government will result in tens of thousands of public sector job losses in Wales. How many of those will involve women? Mrs Gillan: I wish the shadow Secretary of State a very happy Christmas and a prosperous new year, and I thank him for his kind greetings. We are certainly not complacent and any job losses are to be regretted. We were pleased, however, that the OBR’s original 490,000 forecast for the reduction in public sector staff came down to 330,000 in last week’s forecast. I am sure that he will want to welcome that reduction of 160,000.
shamefully closed. The highly respected Fawcett Society is so incensed at the punitive impact on women of Government cuts that it even tried to challenge them in the High Court. As the first woman Secretary of State for Wales, is she proud of her Government’s attitude to Welsh women? Mr Speaker: Order. The Secretary of State must not accuse any right hon. or hon. Member of misleading the House. She has a lot of experience, and I know that she will correct what she has just said. Mrs Gillan: Of course I will correct it, Mr Speaker. The shadow Secretary of State is possibly in danger of misleading the House, because he knows quite well that Newport passport office has not yet been closed and that we have already secured the front-of-house services for it, which will save up to 45 jobs. In 2008, his Government did exactly the same thing to the passport office in Glasgow, so I will take no lessons from him. Mr Peter Hain (Neath) (Lab): On what date was the Secretary of State informed by the Secretary of State for Culture, Olympics, Media and Sport of his plans to change the status of S4C? Mrs Gillan: The right hon. Gentleman knows that I have many meetings with the Culture Secretary on S4C. I have discussed the future of S4C on many, many occasions. Mr Hain: You will have noticed that she did not answer the question, Mr Speaker. The day before the comprehensive spending review, on the evening of Tuesday 19 October, the BBC’s Nick Robinson first broke the news that S4C was to be joined with the BBC before the S4C authority had even been informed. It is not clear from her answer whether the Secretary of State knew what the Culture Secretary was planning before Nick Robinson did or whether, like the rest of us, she found out from him. It saddens me that she has absolutely no influence in the Cabinet. She failed to stand up for S4C, she failed to stand up for the defence training college, she failed to stand up for the Anglesey energy island, she failed to stand up for the Severn barrage and she got a terrible deal for Wales out of the comprehensive spending review. I am sorry to say that she is failing Wales abysmally. If she is not going to fight for Welsh jobs, she should not be in her job. Mrs Gillan: I welcome the right hon. Gentleman back to his place on the Front Bench. For a brief moment during the elections for the shadow Cabinet, I thought we were going to be robbed of his charm and wit in Welsh questions, but that is not to be the case. The Conservative party initiated the legislation on the Welsh language, which helped to put S4C on the map, and I have always supported S4C, both as the shadow Secretary of State for Wales and now as the Secretary of State. The deal for S4C is that it has firm funding for the next four years, and there will be meetings to ensure that it remains independent and continues to make a valuable contribution to Welsh language broadcasting. Mr Peter Hain (Neath) (Lab): How can the Minister and the Secretary of State possibly justify cutting proportionately three times as many Welsh MPs as English MPs, creating monster constituencies in rural Wales and geographically impossible ones in Welsh valleys? Instead of ramming through those changes, why will not the Government maintain the existing system of public inquiries that has protected local interests for generations? Mr Jones: I am surprised that the right hon. Gentleman takes that view. I would have thought that he would be as anxious as Government Members to ensure that votes cast in general elections are fair and of equal value. As it stands, votes in certain parts of the country are worth significantly more than those in other parts. So far as constituency boundaries are concerned, I remind him that they will be determined by the impartial and neutral Boundary Commission, with which I have already had discussions. Mr Hain: But the Minister and the Secretary of State have presided over rigging the situation in advance. Is the Secretary of State proud that by slashing the number of Welsh MPs by fully a quarter from 40 to 30, she is the first Secretary of State for Wales in history to reduce Wales’s voice in Parliament? Why is she also the first Secretary of State to refuse a request for a meeting of the Welsh Grand Committee? Does she not understand the anger about that among Welsh MPs of all parties, including hers? We demand a meeting of the Welsh Grand Committee so that our constituents can see what is being done to them. Mr Jones: Again, the right hon. Gentleman is completely wrong. Our position, to which I would have thought he would be signed up, is that votes across the country should be of equal validity. The current position is that they are not. On holding a Grand Committee, I imagine and hope that he and the shadow Minister, the hon. Member for Caerphilly (Mr David), will be present at the meeting that we have convened this afternoon to put their concerns forward. How on earth can the Secretary of State and the Minister have allowed that pledge to be dumped in the long grass? Instead of capitulating immediately to savage cuts, why do they not stand up and fight for Wales as their Labour predecessors did? Mr Jones: Having read the so-called pledge that the right hon. Gentleman received from the Treasury, I think it fair to say that it was almost meaningless. As he knows, the Holtham commission is due to report substantively next month. My right hon. Friend and I intend to have further discussions with Mr Holtham, and it would be wrong to pre-empt his decision. Mr Peter Hain (Neath) (Lab): May I join in the commiserations to Lord Walker’s family on his death? May I congratulate the right hon. Lady, especially on being the first woman Secretary of State for Wales? However, as accounts given to the media have traduced the truth, I must ask whether she is aware that as Secretary of State, on Monday 10 May, in the Wales Office, I specifically asked and received an assurance from senior officials that work I had put in train months before would have enabled a referendum to be staged this October. Before she answers, may I remind her that whatever she has been saying to the media, she must not mislead this House, especially as she will not have seen the official papers detailing my preparations for the referendum? Mrs Gillan: I thank the shadow Secretary of State for his welcome. I cannot comment on the advice received by the former Administration; however, I do have access to documents that have indicated to me that no work was done on the question before the general election. If the right hon. Gentleman wishes to have a discussion with me about the matter, he is quite able to do so, but no work was done by the Department. The only work carried out was on the order that was to be laid before the House. This was the first question that I asked when I walked into the Department.